I uploaded my first version of gallery. I am not sure it will be the last version or not, but I have to start somewhere. 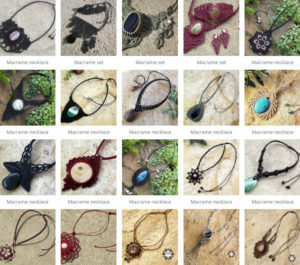 When I was a beginner I loved watching macrame necklaces and wanted to know how they were made, I was trying to find out where the cords are going, so I share my work to you too. It is always an inspiration to see others work, not to copy them, but trying out new techniques, new colors, new stones, new threads, … etc.